We’ve all heard it before: to lose weight, your body must burn stored fat. Yet despite counting calories and exercising regularly, many still can’t shed the pounds. According to the Centers for Disease Control, 66% of adult Americans are overweight, and while the majority of them probably want to trim down, most are losing the battle of the bulge. That could be because they’re not armed with the right weapons. You see, they’re not just fighting fat. New research reveals the true culprit behind the weight loss struggle – hormones – fat burning hormones. Being overweight is often the result of a dysfunctional glandular system. Until the glands are functioning in a healthy manner, the body will stubbornly hold on to excess fat. Many want to lose weight so they will be healthier – the truth is they must first become healthier so their bodies can kick into fat-burning mode. This is why Acupuncture has a major role not only in improving health, but also in promoting weight loss. Acupuncture works by increasing blood flow in the body and allowing the body to heal itself. Acupuncture treats the body as a whole, rather than just addressing one health concern at a time. Trying to lose weight with the cookie diet, the grapefruit diet, the celebrity diet, etc. just does not work. The key to weight loss is to truly understand what is behind stubborn and resistant metabolism. It is now understood that those with weight issues do not lack willpower- they simply have never learned the right way to lose weight. Why stress causes the body to store fat? What your food cravings mean? Why Europeans are thinner than Americans? How to avoid foods that trigger hormone induced fat? Why sleep problems are linked to weight problems? The Advanced Healthcare Solutions program addresses these questions and has proven very successful – especially for those who have a stubborn metabolism. The principles utilized give patients effective leverage over weight loss because they address the very things that control weight loss – fat burning hormones. Hormones control metabolism, and once these hormones are working for them instead of against them, patients have success. There are six fat-burning hormones, and each is triggered by a different series of events. Wouldn’t it make sense to know what these events are and how to trigger them? The key to effective, lasting weight loss is to trigger all six fat-burning hormones to create the maximum fat-burning effect. The result will be major weight loss and a significant improvement in overall health. An added benefit is that some of these hormones are anti-aging as well. It is a revelation to many that their hormones have been working against them, making them fat and distorting their body’s shape. Assessing body shape or type is crucial to creating the right plan to nurture the glands back to healthy functioning. We help you to help identify specific issues and discover your body type. It will also help you learn the correct exercises and the right foods for your body type. Because each gland controls distinct body features, you will quickly learn to differentiate one from another. For example, the thyroid gland controls hair, nails, skin, energy level and body temperature, while the adrenal glands control stress responses and sleep patterns. Different bodies need different solutions. 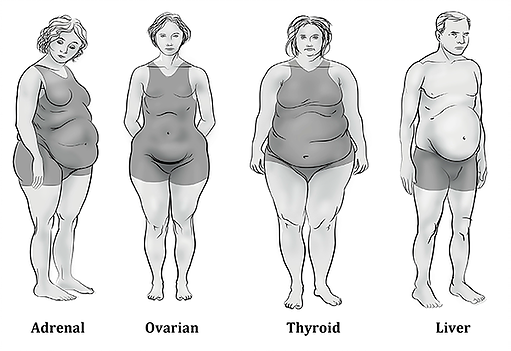 We have found that most people fall into one of four body types. Each needs different foods, therapies and exercises. Each person accepted into our program receives a a plan tailored made for their body type, including an in-depth evaluation and health examination to determine the best route for both weight loss and improved long-term health and wellness. The most important idea to keep in mind as you begin your weight-loss program is that if you are storing excess fat, your body is not healthy. The excess weight is a symptom of an underlying health issue. Rather than trying to lose weight in order to become healthy, you must first get healthy in order to lose weight. Advanced Healthcare Solutions helps patients understand why hormones are key to losing weight and gaining great health. Today, millions of people throughout the world cleanse on a regular basis to promote good health, giving their bodies time to rest and recover. Cleansing regularly helps the body eliminate impurities and reduce unhealthy cravings. But here is the best part: cleansing provides an extra benefit – the release of unwanted fat quickly in a safe, natural way. With so many diet products available today you might ask, “Why is obesity an epidemic in North America?” The answer is simple: Most diet products do not work because they don’t address the important principle of cleansing. Regular cleansing is vital to help the body safely and naturally eliminate harmful substances that may contribute to weight gain. A positive side benefit that comes from such cleansing is the safe, rapid weight release. Discover how to restore your health and balance naturally. Get Marc’s FREE CHAPTER from the best selling book, “The Soul of Success” by subscribing to our mailing list. We hate spam too! We will never sell your email address.